There are two important points systems in Forza Horizon 4. One is influence and the other is credits (CR). Credits are vital in playing this game since most things are purchased with credits. If you wish to get a new car, participate in an auction, purchase a house or buy other stuff like clothing, you need lots of CR. 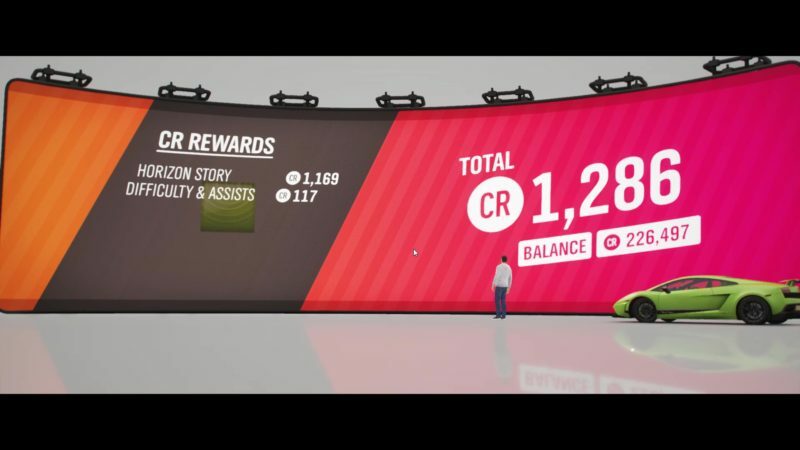 Here’s how you can earn credits (CR) fast in Forza Horizon 4. We’ve listed a couple of ways to make more money in the game. This one is a no-brainer. When you’re first introduced to the game, you will earn CR right at the beginning when you complete your first race or showcase event. The credits you earn is probably influenced by how well you do in the race (e.g. whether you placed first or last) and also the CR bonus from the difficulty. For e.g. if you turn on a lot of the assistance features, then the difficulty drops and the bonus drops correspondingly. For instance, using automatic vs manual changes the bonus a lot, with the former making it much lower. Just adjust the difficulty and you will see how it changes. In any case, you will earn credits (CR) even if you place last in a race. Later on in the story, you will also come across this World’s Fastest Rentals mission. You can get a daily credit payout for buying the business, but I didn’t take note as to how much you will earn. It’s also a mission like the Stunt Driver. You can also get credits simply for getting stars on the speed trap. This 15,000 CR was for 2 stars if I’m not mistaken. If you do have some vehicles that you’re not particularly fond of, you can always use the auction feature. 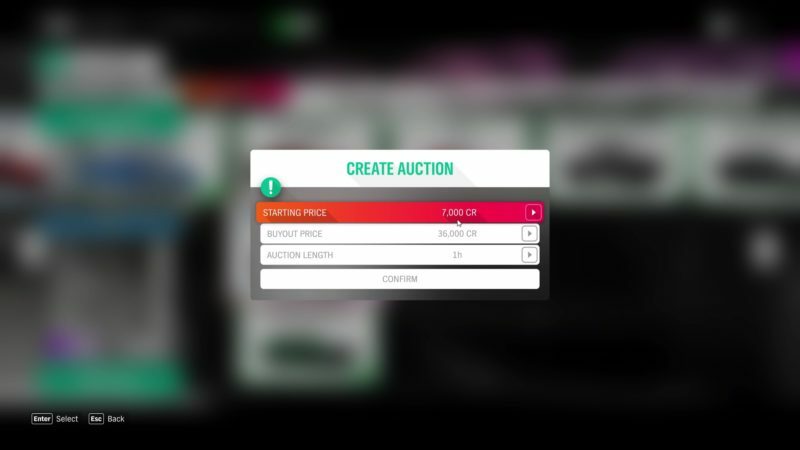 Just create an auction and choose the car you wish to sell. You can’t auction off the car you’re currently driving so if you wish to do so, change the car first. You can set the starting price for the auction and the buyout probably changes automatically if I remember correctly. Then, just hit the “Confirm”. This is how the auction house looks like. You get to see the cars that are going to be auctioned off very soon and make a last minute bid if it’s really cheap. Buying valuable cars for a low price and re-selling at the auction for a high price is one good way to make money in Horizon 4 as well. You will definitely get plenty of cars as you proceed in the game, either from races, leveling up for different types of races, barn finds and also from Wheelspins. For those who are cash rich in real life, you can get the VIP membership and you get many things as listed below. If you sell the Forza Edition Cars, use the Super Wheelspins and utilize the 2x CR bonus for races, you’ll definitely make a lot of money in this game. Next up are the two different Wheelspins. Both will give you either cars, clothing, car horn, emote or even credits. The Wheelspin is the lousier version and it only gives you 1 item per spin. For the Super Wheelspin, you will get three prizes per spin. If you look at the screenshot above, all three are the prizes. This means you can win credits and also cars at the same time. 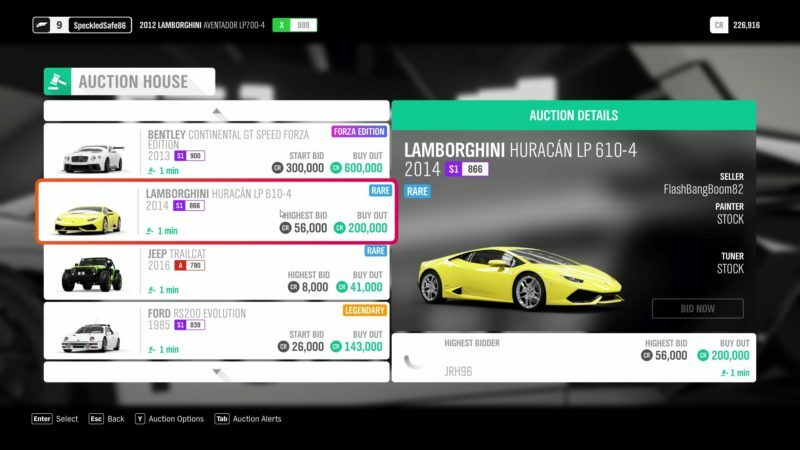 Auction off the cars if necessary to make more money (CR). 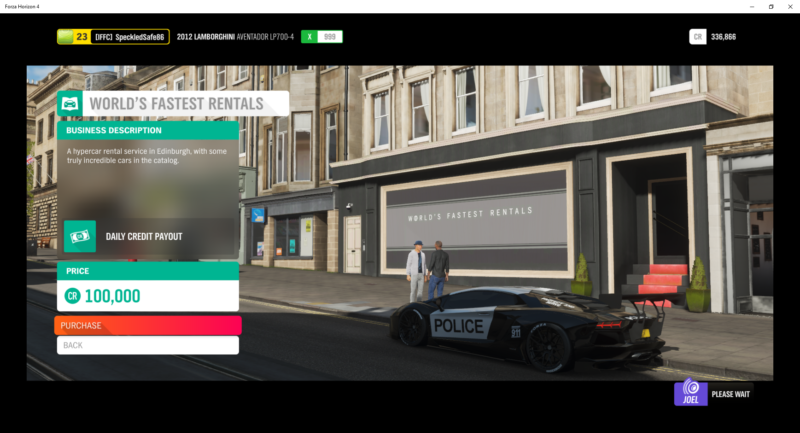 Purchase certain properties (list of houses plus rewards in Horizon 4). Accumulate skill points during free roam or race events. Basically all sorts of events in the game will give you Wheelspins. Super Wheelspins are harder to get and if I’m not mistaken, they give one every time you change season. Another way is to purchase certain houses and some houses give Super Wheelspins as a reward for buying. You can also buy them using Forzathon points as highlighted below. 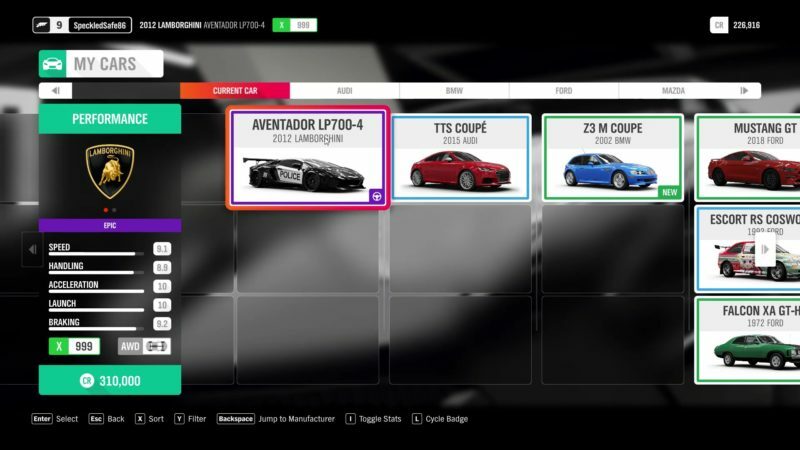 You need to complete all four seasons to unlock the Forzathon and get yourself on the Horizon Roster. Once you’ve unlocked all seasons, you will be able to access this Forzathon shop. 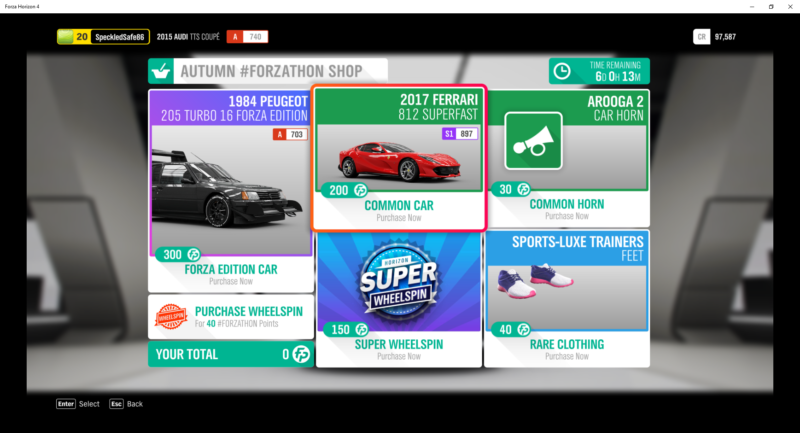 As you can see, you can exchange Forzathon points for Super Wheelspins, Forza Edition cars and so on. This is another good way of making more credits in Horizon 4. 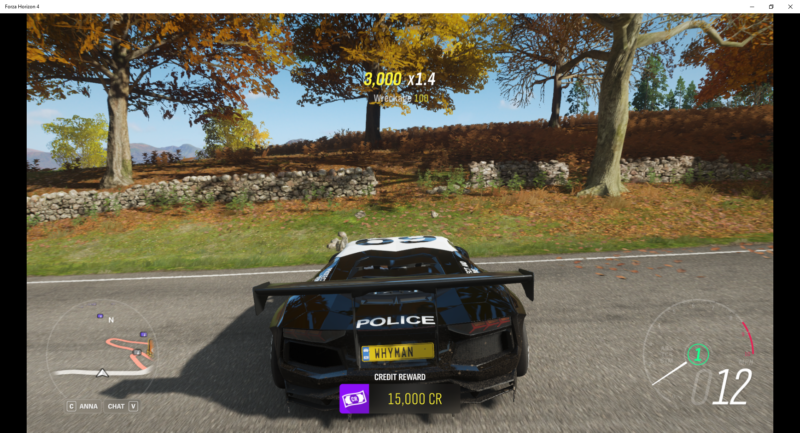 There are plenty of ways to earn CR in Forza Horizon 4, so don’t worry too much about not having enough money. 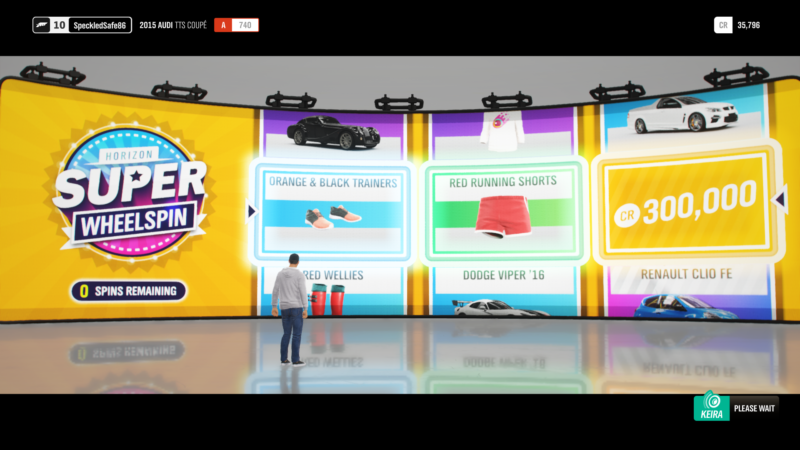 Perhaps the best ways is to get those Wheelspins and Super Wheelspins as they can potentially give you hundreds of thousands of CR in one go. 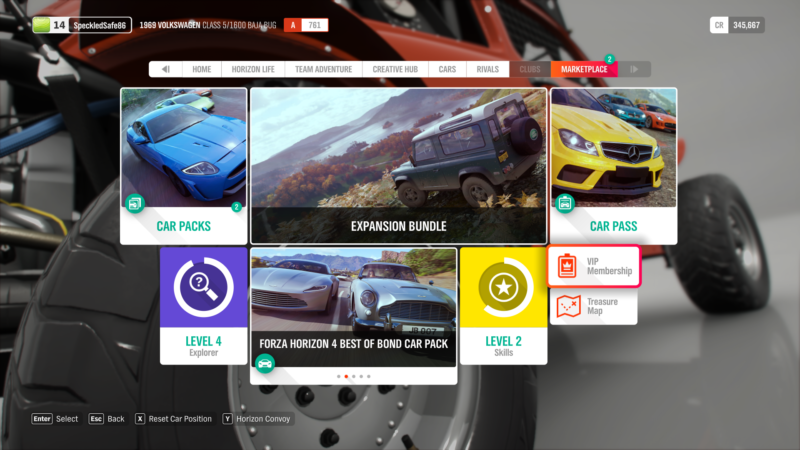 Forza Hub is also a good way to earn credits.